Team Suzuki Press Office – January 16. 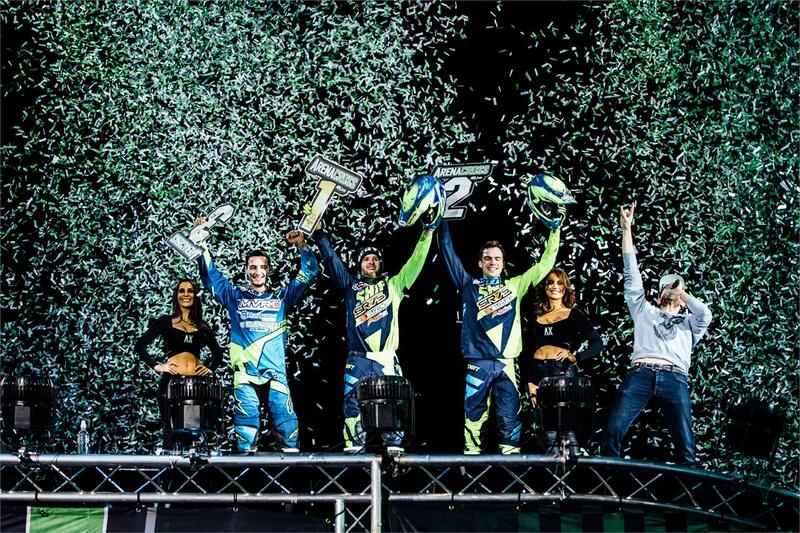 Cryille Coulon and reigning AX Champion Thomas Ramette dominated the weekend’s Arenacross UK Championship second round in Glasgow, Scotland with a 1-2 for the SR75 World Suzuki Team. After the disappointment of round one in Manchester, when bad luck in the Main Event dropped them down the leaderboard, the two Frenchmen had a point to prove. Both RM-Z450 riders were on top-form from qualifying on Friday, Ramette setting the fastest lap at the SSE Hydro Arena with a time of 21.483 and Coulon second on 21.485. The Pro class Main Event on Saturday evening brought a show of control and focus with both SR75 Suzukis rounding the first turn together and that focus only increased throughout the race: Coulon took command from the start with Ramette a heartbeat behind as both clicked-off the laps with a smooth flow, and after 14 laps, they crossed the line first and second.